RIDING LESSONS AVAILABLE FROM AGES 5 YEARS TO ADULTHOOD. I GIVE RIDING LESSONS FOR YOUNG CHILDREN UP TO ADULTHOOD FOR THE LAST 8 YEARS. 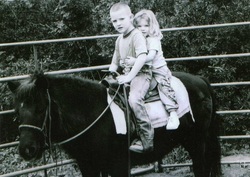 I HAVE BEEN AROUND HORSES EVER SINCE I CAN REMEMBER. MY MOTHER AND FATHER HAVE BEEN IN THE HORSE WORLD FOR MANY YEARS. THE HORSE IS THE REASON MY PARENTS GOT MARRIED. MY WHOLE FAMILY ARE HORSE CRAZY. I DO HAVE REFERENCES UP ON REQUEST. MY SPECIALTIES ARE... HORSEMANSHIP, BARREL RACING, TEAM ROPING, SOME CUTTING, BREAKAWAY ROPING, WESTERN PLEASURE, REINING, SOME ENGLISH AND ANY HORSE/RODEO/PLAY DAY EVENT, POLES, AND EQUESTRIAN DRILL TEAM. IF YOU HAVE A SPECIALTY THAT YOU ARE SEEKING AND I AM NOT ABLE TO HELP; I JUST MAY KNOW OF A FRIEND THAT CAN HELP YOU. I AM WILLING TO TRAVEL TO YOUR PLACE OR HAVE YOU COME TO ME. I HAVE A COUPLE OF MARES THAT ARE VERY GENTLE THAT I GIVE LESSONS ON. I CAN HELP YOU WITH YOUR HORSE PROBLEM/NEEDS OR HELP FIND YOU A HORSE THAT SUITES YOUR FAMILY. WE CAN TAKE IN OUTSIDE HORSES TO HELP YOU WITH A PROBLEM THAT YOU AND YOUR HORSE MAY BE HAVING. A LITTLE BIT ABOUT MYSELF...I AM A CHRISTIAN WOMAN AND STRIVE TO RAISE MY CHILDREN IN A CHRISTIAN MANNER. I HAVE PATIENTS TO ADORE ANYTHING WITH IN MEANS. I HAVE BEEN TEACHING IN PRIVATE/PUBLIC SCHOOL/LEARNING CENTERS FOR MORE THAN 15 YEARS NOW! MY HUSBAND AND I HAVE BEEN INVOLVED WITH OUR LOCAL SOCCER ASSOCIATION. WE ARE ACTIVE IN OUR LOCAL 4H CLUB. I HAVE EXPERIENCE WITH CHILDREN FROM BIRTH TO HIGH SCHOOL AND SOME ADULTS. SOME OF MY CLIENTS GO ON TO WIN SADDLES, BUCKLES OR MONEY. JUST GETTING THE CONFIDENCE OR COMFORTABLE WITH RIDING SUCH A GRAND CREATURE HELPS THE EVERYDAY PERSON WITH THEIR TRAIL RIDING SKILLS. SO IF YOU ARE INTERESTED IN GETTING RIDING LESSONS FOR YOU OR YOUR CHILDREN; LET ME KNOW BY GOING TO THE CONTACT US! PAGE AND LEAVE ME A MESSAGE. I WILL GET BACK WITH YOU AS SOON AS POSSIBLE! LOOK ON THE VIDEO PAGE TO SEE MY DAUGHTER AND HER FRIEND RUNNING BARRELS. MY DAUGHTER HAS BEEN RIDING SINCE SHE WAS A LITTLE GIRL, HER FRIEND HAS BEEN UNDER MY WINGS FOR AT LEAST THREE YEARS. LIKE MY DAUGHTER AND HER FRIEND WHO TRAVEL TOGETHER, RIDE TOGETHER AND HAVE FUN TOGETHER; THEY CAN NOT BE STOPPED. WHEN CHILDREN GET TO KNOW ONE ANOTHER; HAVE A COMMON INTEREST THERE IS NOTHING THAT CAN STOP THEM. I AM VERY PROUD OF MY CLIENTS AND MY FAMILY AND ALL THAT THEY ACHIEVE. MAY GOD GIVE YOU THE STRENGTH TO CONTINUE ON THE JOURNEY HE HAS SET FORTH. MAY YOU AND YOUR HORSE ADVENTURE BE BLESSED AND SAFE!